GEL and western blot imaging documentation is made simpler with the Omega Lum G, says Aplegen. The imaging package comes with everything needed, it says, to quickly start capturing images of gels and blots. The company says this comes at an ‘incredible’ low cost for such a high specification system. As with all Aplegen systems it is powered by the intelligent SmartCapture Technology which simplifies imaging to the point where the user just has to pick an application and the image is automatically captured with the optimum exposure. This automatically controlled system even takes care of filter selection and focusing. Within seconds the user will have a high quality publication quality image at the click of a button. The Omega Lum G can be used for fluorescent gels and chemiluminescent blots. The multiple excitation sources also make it suitable for nucleotide and protein stains. The system is compatible with an extensive range of dyes including SYBR Safe, SYBR family, Ethidium Bromide, Coomassie Blue, Silver Stain, AdvanStain Scarlet, SYPRO Ruby, Oriole and more. With so many applications possible the Omega Lum G is said to be the perfect solution for a busy multiple user laboratory. At its heart is a CCD camera with six million pixel resolution, cooled to -350C. The resulting images are described as stunning and noise free, essential for high quality chemiluminescence imaging. 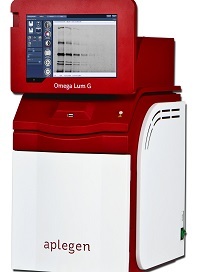 Omega Lum G can accommodate large format protein and nucleotide gels in its 20.5 x 25cm imaging area. Lighting includes a dual wavelength transilluminator, white light conversion screen, EPI white and blue LEDs.